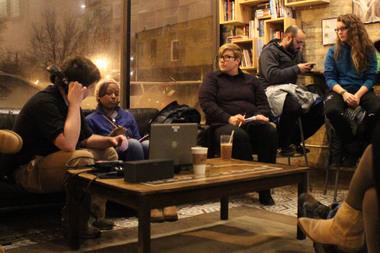 ENGLEWOOD — A group of 20 South Siders gathered at a cafe Monday evening to talk about gun violence as part of the Illinois Humanities Council’s Reporting Back series. 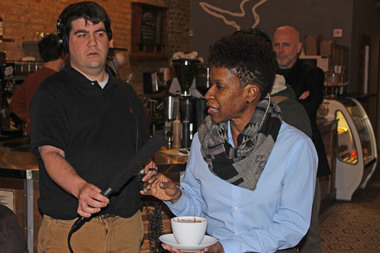 It was the council's first neighborhood dialog series, which was led by journalist Bill Healy and South Sider Chiquita Toby, at Kusanya Cafe, 825 W. 69th Street. Healy and Toby were paired up through The Odyssey Project. The two are working on a three-month long radio project that centers around individuals who live in neighborhoods where gun violence is a part of life. “We wanted to create opportunities for dialog between the media and the community to ensure higher quality, deeper story telling around those crucial issues affecting communities, and just to really help the community dialog inform the reporting process,” said Simon Nyi, program manager for media and journalism at the council. Community members gather for the Illinois Humanities Reporting Back series on Feb. 9, 2015 at Kusanya Cafe, 825 W. 69th St. Left, is journalist Bill Healy and next to him sits Chiquita Toby, a South Side resident. Healy, who is a freelance journalist, has produced month-long series in the past for Chicago Public Radio station WBEZ. He produces StoryCorps for the station and some of his work has been on NPR and the BBC. The discussion focused on making the right choices. “I got disgusted with seeing a lot of people on the corner, with there being a lot of young pregnant women. I didn’t feel like that was going to be my story,'’ she said. And it hasn’t been so far. After dating her now husband for four and a half years, they married in August. She said she’ll have children when they’re ready. Toby works for the U.S. Department of Education, where her department handles debtors' correspondence. For Toby and two friends from the neighborhood, Laurina Davis and Deotis Tole, all agree that wanting better starts with making a choice. “I feel like there is a choice and I made the decision to go down a different route,” Toby said. “I won’t say I’m a big success because I’m still a work in progress,” she said. Attendee Lisa Daniels, 52, agreed. The Englewood resident lost a son in 2012 to gun violence. She said that he participated in gang activities. “My son had choices and he made different choices, he made choices that got him killed,” Daniels said. She said that anyone can change their situation if they mentally escape first. “I used to tell my son that wherever you go, take yourself with you, and if you’re the same person that is experiencing the same situation over and over again, then you’re the person you need to look at,” Daniels said. “It can’t be your outside situation or your outside circumstances, you have to look at you and you have to make a decision to do something different,” she said.